The new Star Trek film is not a standard Star Trek film. While possessing of a wealth of references to older Star Trek canon, it is not a film which requires any amount of prior Star Trek knowledge in order to be enjoyed. Above all else, and I feel that film makers charged with sustaining long-time franchises often forget this, this film is an enjoyable one. I saw this recently with a group of friends (whose identities I will not reveal to protect their reputations), one of whom had never seen a Star Trek movie nor watched a single episode. Afterwards, while the rest of us avid trek-fans discussed the finer points of how well the young cast had adapted the characters we all knew and loved, the lone non-trek-fan was able to relate that, despite having no foreknowledge of any of the in-jokes (and there were many) he found the film enjoyable. This film, like many recent releases from studios strapped for ideas, is a prequel and is set in a time period prior to the original series (and after the series “Enterprise”, for those who know what that means). We join Kirk, Spock, McCoy, and friends as young cadets at Star Fleet Academy and learn of how they meet each other and of how their initial meetings eventually shape the eventual crew of the Enterprise. There is even a nod to Gene Roddenberry’s original pilot episode of Star Trek with the inclusion of captain Christopher Pike, as an instructor at Star Fleet and captain of the Enterprise prior to Kirk. The film opens with an engaging action sequence in which Kirk’s father, then a first-officer, is temporarily promoted to captain when his captain is lost while investigating a mysterious unidentified ship which we later learn is a Romulan mining ship from the future. The use of an element from the future allows the writers to diverge as they wish from many of the restraints they would normally encounter in trying to preserve consistency with the earlier/later episodes in the star trek universe. The ship, predictably, is overwhelmed by the vastly superior firepower of the ship from the future, although Kirk the elder is able to occupy the Romulan ship for long enough for the evacuating shuttle craft to make an escape, during which James T. Kirk is born (and fans can tick off their first checklist item – Kirk being born on a shuttle craft). Production design is excellent, in that they were able to give a look consistent with the original series yet keep the technology looking more advanced than our current technology, much of which was inspired by the original Star Trek. The look of the bridge of the Enterprise as well as the costumes and the exterior of the Enterprise itself look sufficiently modern, while not being overly retro. Special effects are also brilliant because, while state-of-the-art (the special effects of all Star Trek films were state-of-the-art at the time that they were made), they are delightfully unintrusive and don’t make the common mistake of distracting from the plot. The plot rolls along nicely and is paced well. J. J. Abrams, a director more well-known for his work in television, and mostly-bad motion pictures, has produced a great product of the storyteller’s art. He deserves special praise because of the peculiar problems of having to tell a story where many elements are generally already known by fans (although the use of alternate realities resulting from time travel is useful here), he instead concentrates on elements which are more important anyway like character development. In particular, I enjoyed the development of Spock’s character and the way that his human-vulcan duality was played gave the film and his character some depth, which is often lacking in big-budget blockbuster action films. The interactions between Kirk, McCoy, and Spock drive the dialogue and make the characters very real. Their interaction, for me, was one of the best parts of the original series, and the preservation of this as a central element was much appreciated. The cinematography was very well-done, in particular when it came to exterior space-shots which were filmed in a disoriented, twisting-panning fashion to contrast the simulated-gravity, straight up-down environment of the interior of ships. A friend described the special-effects well “it’s like the original series, but on steroids”. The shot making, as well as the sound editing contributed to a very visceral and intimate feel which further drew the viewer into the universe of the film and suspended disbelief. 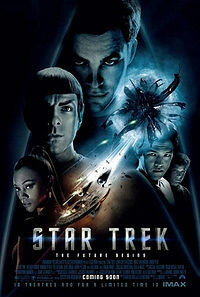 It is said that all odd-numbered Star Trek films are pretty average, while the even-numbered ones are good. While this is the 11th in the series, it bucks the trend by being not just a good Star Trek film, but by being a good film, period. At a time when the franchise is struggling after the cancellation of the series “Enterprise” and box office non-success of “Nemesis”, this is what studio execs as well as fans desperately needed. I hope this re-boot of the franchise is the start of a new golden age of Star Trek, or at the very least, the prelude to a few more good Trek films. Definitely one to see in the cinema environment. Four stars. see… i had problems with it. the plot and content – whatever; i’m no die hard fan, so no comment. and i agree that the cinematography was great. but it was stuff like that random (and poorly painted) green girl, blowing up a black hole while simultaneously failing to have superior weapons capabilities in combat, leaving the manning of ships to 17 year olds while the older experts – teach?… those things bother me. hi clare. I like how you’ve linked the amnesty usa website. Maybe being poorly-painted green is a fashion thing in the future. Yeah, blowing up black holes is a bit ridiculous, but I’ve learned to turn off my “physics brain” whenever I watch films, so those things don’t really bother me as much as they probably should.